Spider-Man at the End of the 1960s: The Kingpin, Black Widow and Dr. Octopus! Spider-Man Fights for His Life Against Deadly Foes, Plus Meets Guest Superheroes! Marvel Essential Spider-Man volume 4 contains issues Nos. 69-89 of the original series, with writer Stan Lee putting our favorite web-slinger through some of the biggest fights of his career. 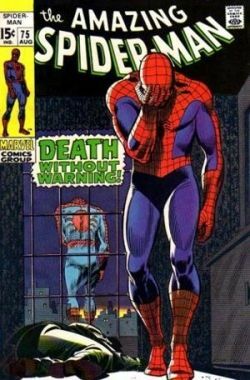 These stories were originally published from February, 1969 to October 1970, when Lee and artist John Romita had Spider-Man rolling through one great story after another. The Kingpin, who would become the chief nemesis of Daredevil a decade later, is the villain in two separate series of tales here. And Dr. Octopus has never appeared so deadly as he does in this collection. In between, Lee finds time to slip in guest appearances by the Human Torch, Quicksilver and the Black Widow. This volume also contains the main tales from Amazing Spider-Man Annuals Nos. 4-5, which sad to say are the weakest of the collection. 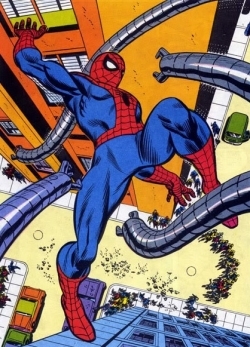 The illustration here is from Amazing Spider-Man 89, and any comic-book fan should recognize those metal tentacles! The ISBN of this book is 0-7851-0760-6. Stan Lee Weaves a Multi-Issue Saga! Writer Stan Lee was at the height of his story-telling abilities toward the end of the 1960s, seamlessly weaving one story into the next while juggling a cast of characters that seemed to have lives of their own. The first six issues of this collection illustrate this magnificently. The collection starts out with issue No. 69, which opens with Spider-Man in search of the Kingpin. The Kingpin stole an ancient tablet in the previous issue (which isn't included in this collection but don't worry you can still figure out what is going on). 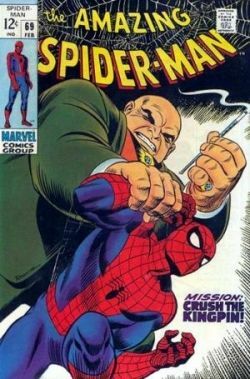 Over the next few issues the tablet will become an object that drives the storyline, as it falls into Spider-Man's hands but he has difficulty turning it over to the police because the Kingpin has incriminated Spider-man in the object's theft. Issue No. 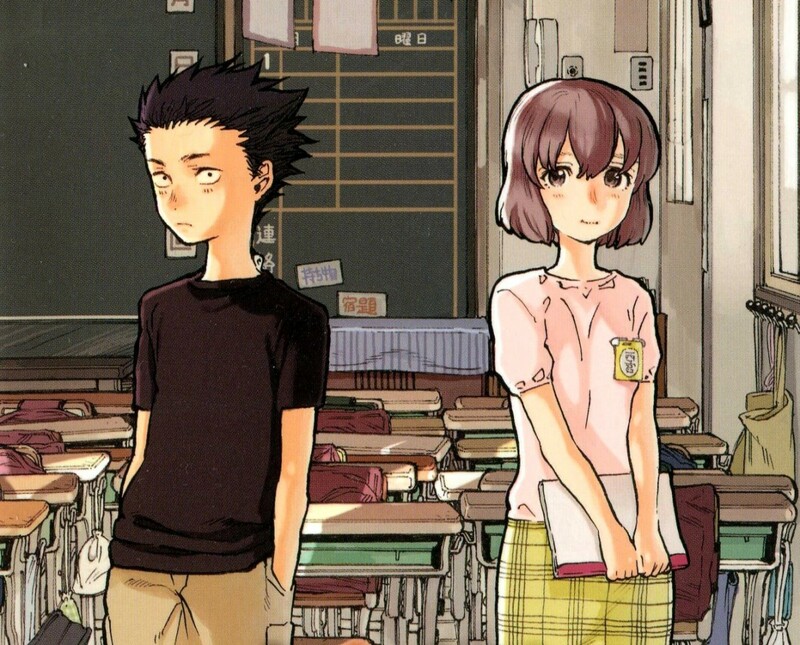 69 also has a great cover (shown here). It hearkens back to the days when Spider-Man was stronger than the average human but wasn't as powerful. Today, he could easily beat the Kingpin in a fist fight. Artist John Romita was doing very strong work at this time, with the very underrated Jim Mooney helping with the inking. In this issue the tablet that has been driving the storyline for the past six issues is finally explained, and what a secret it is! The tablet has come into the possession of an old crimelord named Silvermane, who has kidnapped a biologist named Dr. Connors to decipher its hieroglyphics. Connors does, and creates a potion that provides the old gangster with youth. But, as we find out, it's foolish to mess with the natural order and what happens to Silvermane is tragic. When I first read this as a teenager (having bought the original from a back-issue dealer) I thought the climax was a bit of a letdown, but now I see that writer Stan Lee was reaching for something more than the usual superhero fight. And he succeeded wonderfully. Remember how I said Lee was making one story flow into the next story rather seamlessly? Well. as longtime Spider-Man fans know, Dr. Connors is also the Lizard, a villain who was the result of an experiment gone wrong. So the next two issues feature Spider-Man tracking down and stopping the Lizard from wrecking New York City! 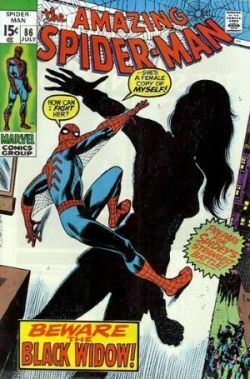 Not much happens with Spider-Man in this issue, which is really designed to update and re-introduce the Black Widow to comic-book fans before she starred in her own series. And that's OK because she has always been one of my favorite female characters at Marvel. 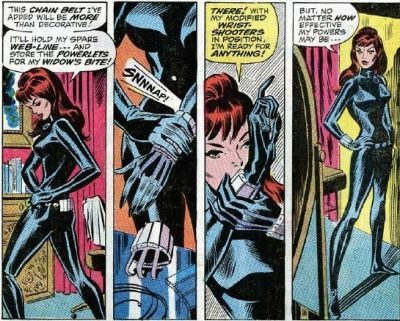 The Black Widow had first appeared in 1964 in an early Iron Man tale as a Russian villain, later becoming a costumed sort-of-hero who was the girlfriend of the Avengers' Hawkeye. 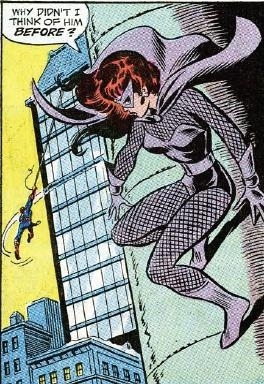 For a few years she would pop up every now and then in the Avengers comics, but in 1970 Marvel made the decision for her to branch out on her own. So in Amazing Spider-Man No. 86 the Black Widow decides she wants to track down Spider-Man to find out the secret of his powers, so she can gain them for her own use (OK, that's kind of silly but writer Stan Lee needed some reason for her to be in the book). The tale recounts her past and introduces her new costume, inspired by the ``swingy seventies'' Lee has her say! The blue-black skintight costume is a great improvement over the blue-gray one that she had been wearing and that looked anachronistic by 1970. The new one would become her classic look and would be the model for Scarlett Johansson's look in the Iron Man and Avengers movies. There isn't much of a confrontation with Spider-Man, who is much stronger than she is, and she retreats from the scene. At the end, she decides to simply be herself. Which Black Widow Costume Do You Prefer? This collection includes her appearances in Amazing Adventures Nos. 1-8, which started right after her re-introduction in the above Spider-Man issue. The Spider-Man story is included in this volume, as is her debut in Tales of Suspense No. 52 and a later appearance in Daredevil No. 81 (after she was phased out of Amazing Adventures). Two-Thirds of a Great Story! This Marvel Essential volume only contains the first two parts of a thrilling battle against Dr. Octopus in Amazing Spider-Man Nos. 88 and 89. It's unfortunate that Marvel Comics broke up the series this way, as the third part of the story appears in Marvel Essential No. 5 and I would have loved to have had them in the same book. The cover of Amazing Spider-Man No. 88 calls Dr. Octopus Spider-Man's deadliest foe, and he's always been one of my favorites. But writer Stan Lee starts the story with one of his usual twists. Dr. Octopus has been separated from his mechanical arms, which have been put on display in a New York museum. But little do the authorities know! 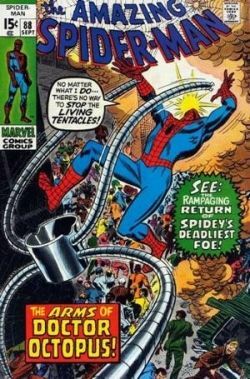 Dr. Octopus has gained long-distance control of the arms, and they flee the museum on their own, leading to a bizarre fight with Spider-Man. The arms escape, then help break the villain out of prison. This leads to an all-out battle in issue No. 89, with a final panel that I've reprinted up in the introduction. Needless to say the story continues in issue No. 90! Two things help make this three-part story special. For one thing Dr. Octopus is portrayed as more violent and dangerous than usual, which is fitting because ... well, you'll have to read No. 90 to find out. The second reason is that Gil Kane drew No. 89, with usual Spider-Man artist John Romita doing the inking. With some characters and some inkers, Kane's work comes across as a bit too unrealistic to me, but for some reason I think his style works with Spider-Man. Maybe it's Romita's influence. The Marvel Essential series began in 1996, and there are now dozens of books in the collection. Each book contains 20-30 issues printed in black& white on cheap quality paper to keep the costs down. 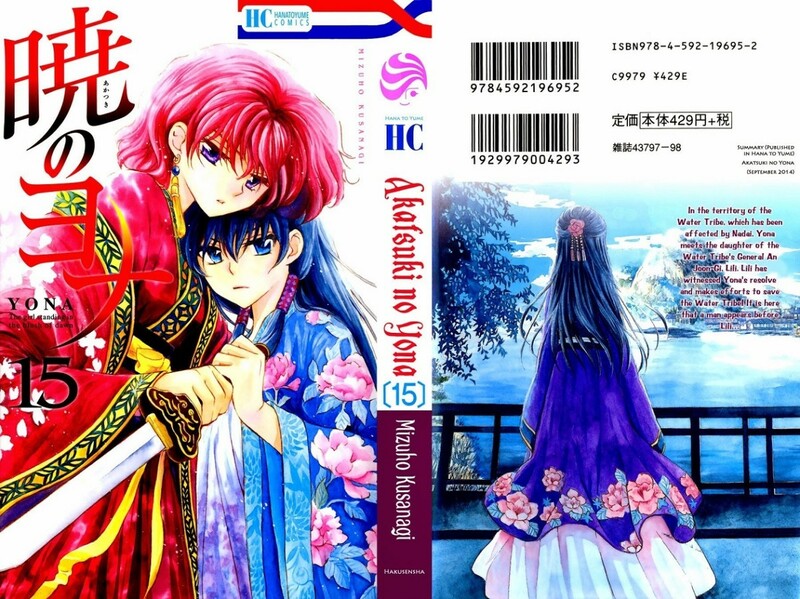 Some volumes have been reprinted more than once, with different covers, so make sure you check which issues are contained in a book so you don't accidentally buy a collection you already have! You can find almost every Marvel Essential book on Amazon, and I'm sure there is one for every comic book fan! Marvel Essential Fantastic Four Comic Book Review: Dr. Doom and Daredevil Guest Star as the Legend Grows! Marvel Essential Fantastic Four: Galactus, Silver Surfer and the Black Panther Debut! Essential Iron Fist: A Marvel Comic Book Review! The Avengers in the Late 1960s: A Marvel Comics Review! Peter Parker, The Spectacular Spider-Man: A Review of the 1970s Marvel Comics Series! Marvel Essential X-Men Comic Book Review: Wolverine, Storm and a Return to Greatness! Marvel Masterworks X-Men Comic Book Review: Enter the Phoenix! Plus Wolverine, Storm and Nightcrawler! X-Men Reborn in the 1970s: Storm and Nightcrawler Debut, plus Wolverine! The Avengers Debut! A Comic Book Review of the Marvel Masterworks Collection! Spider-Man Lost in the 1960s: Doc Ock Wins, Plus Ka-Zar! Daredevil Visionaries: Frank Miller A Marvel Comic Book Review of The Complete Elektra Saga! Geppi's Entertainment Museum in Baltimore: A Tourist's Guide to Comic Book Heaven! New York Comic Con Anime Festival: A Comic Book Fan's Review! Of Comic Books and Family Vacations: Who is GoldenRuleComics? I hope you enjoyed reading this review as much as I enjoyed revisiting the old comic books of my youth. Please let us know what you thought of this review, Spider-Man, Black Widow or comic books in general. Nice lens, I'm old enough to remember when some of these were released!!! I have to say that the comics will always be better than the movies. Love the old Spiderman, specifically the introduction of the Black Widow, who has always been one of my favorites. Very cool lens, liked it a lot! I enjoyed watching Spiderman on tv when I was a kid although I've never read the comics. Spiderman was my absolute hero when I was very young, and his cartoon was by FAR my favourite during my childhood. Thanks for bringing back such great memories. This was a very good review. I never read the comics to speak of. I didn't have access to them at home, and in the 1960s, I was too busy with college. But I saw some of the movies: Spider Man, Superman, and Batman. I enjoyed the movies. 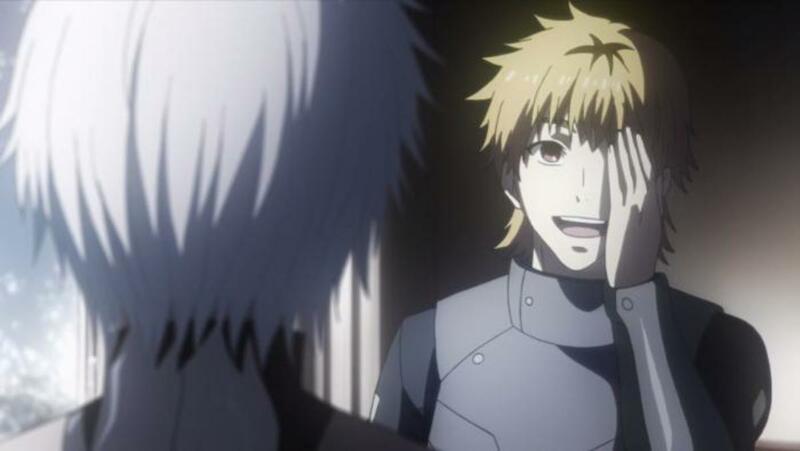 The heroes and villains were interesting, and I was glad the good guys always won. I graduated from that to James Bond movies, which I enjoyed largely for the same reasons. I can see that you know your Marvel comics, that's awesome! Wow! I think I bought all of the above. Very cool lens about some very excellent comic books. I'm not a comic fan but a friend is. She is crazy about them and she has been collecting them for years now. I think she is probably sitting on a fortune now given how much some of these old comic books sell for on eBay.